CROSSOVER IN THE TUBE at Finsbury Park, formerly the northern terminus of the Great Northern, Piccadilly and Brompton Railway, now known as the Piccadilly Line. 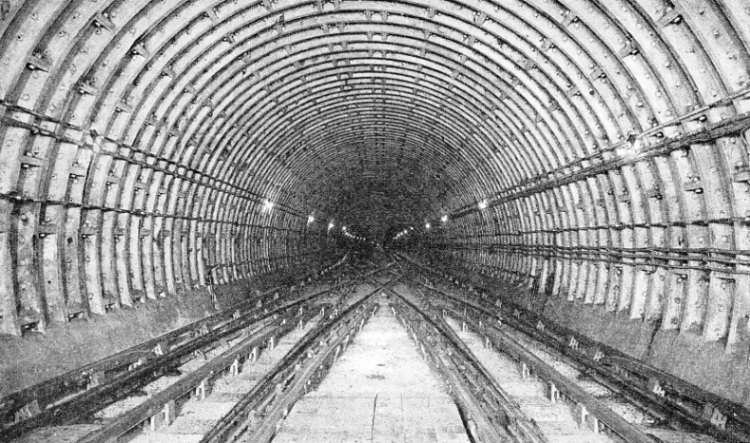 For the purposes of the crossover the two tubes were expanded into one large tunnel. OPERATED by the London Passenger Transport Board, (generally known as London Transport), the underground railway system of London may justly claim to be the most remarkable example of the mass handling of passengers that the world has yet seen. At different times the traffic chiefs of almost every great city in the world having underground transport have been to London to study London’s Underground, which is regarded as a model of its kind. The underground lines of London Transport are divided into two main groups. The first and by far the older group comprises two railways - the Metropolitan and the Metropolitan District, which joined up to form a circle, serving on its course a large area of inner London. In their construction there was little or no real tunnelling; cuttings were excavated, sometimes along the line of busy streets, such as Euston Road, and elsewhere between the streets, and were afterwards roofed over. This is known as “cut-and-cover” work, and is in some ways easier to carry out than deep-level boring, though it involves considerably more distur-bance of property. The other group consists of the deep-level lines, or the tubes proper. Of the shallow-level lines the Metropolitan was the first in the field. In 1863 it was opened through from Bishop’s Road, alongside the Paddington terminus of the Great Western Railway, to what is now Farringdon, and two years later came an extension to Moorgate, though Aldgate was not reached until 1876. Meanwhile, the Metropolitan District Railway had begun operations, and had opened from Kensington to Westminster in 1868; three years later it had reached Mansion House. It was not, however, until 1884 that the Metropolitan and the Metropolitan District had linked up and the well-known “Inner Circle” had come into being, worked jointly by both companies. All this was long before electricity had been thought of as a motive power; so dependence was placed upon steam. Even though the Inner Circle lines were brought out into the open wherever possible, the lengthy stretches of tunnel and the frequent train service, in cramped compartment coaches and amid smoky and sulphurous unpleasantness, made the travel conditions in those days something better imagined than described. Even to-day steam trains are still to be seen on the north side of the Circle. The Great Western Railway works its freight trains over the Circle lines from Paddington to Smithfield Depot; and the London and North Eastern and London, Midland and Scottish Railways have access, over the four-tracks section east of King’s Cross, into Moorgate with their suburban trains, as well as to the south of London, by way of Farringdon and Ludgate Hill, with an important through goods and coal service. But these steam-worked trains are relatively too infrequent to affect the comfort of present-day Inner Circle travel. Between 1903 and 1905 the changeover from steam to electricity took place on the Inner Circle, and the various branches that the two companies had thrown off from the Circle into the London suburbs were also electrified. In this way the Underground trains became “Overground” as they travelled out through the open country westwards from South Kensington to Wimbledon, Richmond, Hounslow, Ealing, South Harrow and Uxbridge; eastwards from Aldgate to Barking; and north-west from Baker Street to Harrow and beyond. In this chapter, however, our concern is chiefly with the deep-level lines, better known as the tubes. In 1890 a railway was opened from Monument Station, in King William Street, just north of London Bridge, down into south London at Stockwell. The trains ran in two parallel tubes of cast iron. Originally the intention was to haul them by cables, but more or less as an after-thought - for electric traction was then in its infancy - it was decided to use electric locomotives instead. To keep down the cost of boring the tunnels, an internal diameter no greater than 10 ft 2-in was decided on, so that the cross-sectional dimensions of the coaches had to be small. 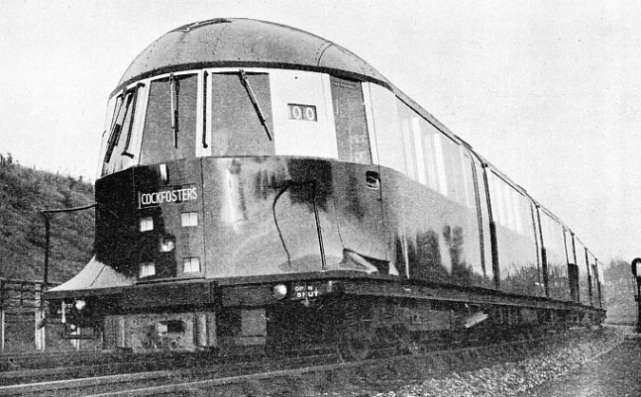 The original vehicles had no windows; ventilation was more or less non-existent; the seats were arranged longitudinally down the sides of the cars; and it was necessary to sink the floors as a well between the wheels to allow passengers to stand upright in comfort - a remarkable contrast with the luxury of present-day London tube coaches. Yet the City and South London Railway was a beginning, and a beginning of the utmost importance. It was the first deep-level tube railway in the world. Not until the present century opened did London acquire its second tube. Increasing congestion of the streets by omnibuses was making it clear that something drastic needed to be done to reduce the number of passengers moving through the streets. Deep-level tunnelling offered the most suitable solution of the problem, because it involved no disturbance of property; if at a sufficiently deep level, a tube could be kept out of the way of sewers, electric, gas and water mains, and other underground adjuncts of modern civilization. In 1900, therefore, the Central London Railway was opened from the Bank to Shepherd’s Bush. It was popularly christened the “Twopenny Tube”, because in its earliest days a uniform fare of twopence, irrespective of distance, was charged. Later on, how-ever, it was found that short-distance passengers objected to pay twopence when they could be carried the same distance by bus at half the fare, so that the more usual practice of fare proportioned to distance came into force. In 1937 the line was officially renamed the Central Line. 14-tons machines of the City and South London. Considerable trouble was therefore caused by vibration of the buildings in the streets under which the Central London passed, despite its depth below the surface. For almost the whole of their length the tubes are run below the centre of streets to keep building vibration to a minimum, and this practice accounts for the frequency of sharp curves, as the lines turn the corners from one street into another, sometimes at right angles. In this way, however, the Central London was more fortunate than the others, for it proceeded west under Cheap-side, Newgate Street, Holborn and Oxford Street, more or less in a straight line. But because of the vibration nuisance, in 1903 the Central London abandoned its independent locomotives, and became the pioneer in Great Britain of multiple-unit working, whereby the motive power is distributed among motor coaches throughout the train, with the motors all under the control of the driver at the front end. No attempt was made to build the Central London tunnels to such restricted dimensions as those of the City and South London, for, with a steadily growing traffic, these small bores were found seriously to hamper the operation of the line. 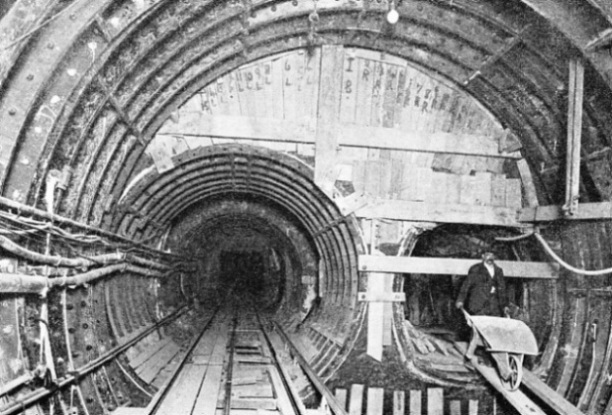 In 1924, when the City and South London was extended at either end to connect with another tube, an essential part of the work was that of enlarging its tunnels throughout their length - a costly operation - and lengthening all the platforms to the tube standard. The Central London Railway bored its tubes to the standard tube diameter of 11 ft 8¼-in, and only its platforms fell short of what has since become standard length; this deficiency was rectified as part of the extension scheme into the suburbs which was started in 1937. By 1906 the Baker Street and Waterloo and the Great Northern, Piccadilly and Brompton Railways (“Bakerloo” and “Piccadilly” for short) had come into being; in the following year the “Hampstead” tube - or Charing Cross, Euston and Hampstead Railway, to give it its full name - was opened. In 1910 these three were amalgamated into the London Electric Railway. By degrees the Underground Electric Railways of London, which in 1902 had taken over the Metropolitan District Railway, obtained a controlling interest in all the London tubes. In 1933, the far greater project of the London Passenger Transport Board was launched, covering the operation of all London’s underground railways, including the Metropolitan, and the buses and tramway cars as well. 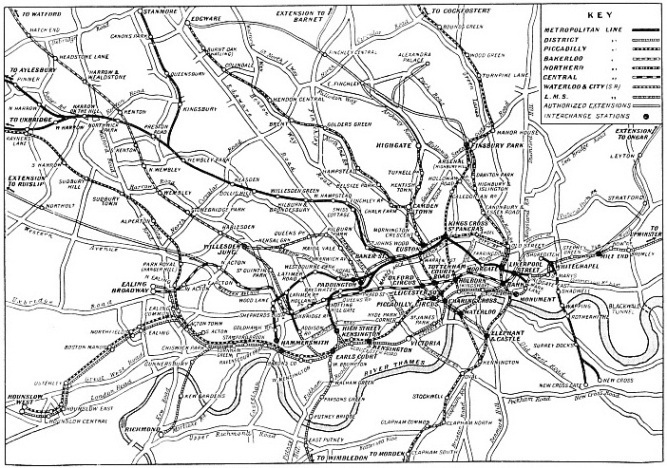 A feature of great importance in the building of the tubes was that wherever their routes intersected one another, or the lines of the other London electric railways, exchange stations were built so that, by the use of two or more of the Underground lines, a passenger could travel conveniently between different parts of London without coming to the surface. 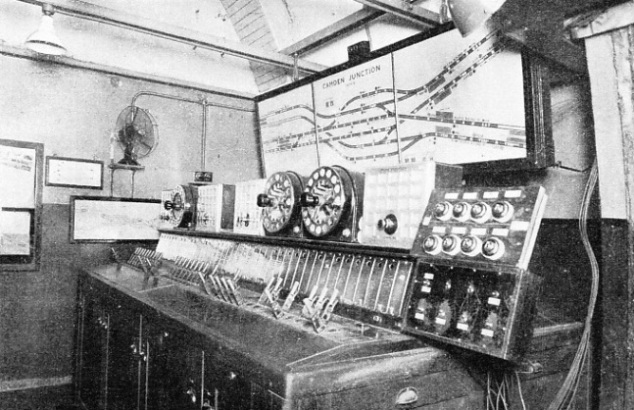 SIGNAL CABIN AT CAMDEN TOWN, the double junction on the Hampstead Tube, renamed the Northern Line in 1937. Northwards there are two tubes to Hampstead and two to Highgate. Southwards there are two tubes to the West End and two to the City. All tubes are linked up by an ingenious system of underground flying junctions, and traffic reaches a maximum frequency of 110 trains an hour. Small levers operate the signals electrically and the positions of trains in all the tubes are indicated on the illuminated panel above the levers. But the tubes were far too valuable a means of transport to remain pent below ground in the central area of London. To bring passengers by tube train without change from outlying suburbs into the heart of the metropolis was the next step. And so one tube after another has pushed out from its original termini into the open country. The Hampstead Tube (now Northern Line) has been extended north from Golder’s Green to Edgware, and immense new suburbs have developed round its open-air stations; southwards it has linked up at Kennington with the City and South London, and the two have extended their tunnels down through Tooting to Morden. On the journey from Golder’s Green to Morden the passenger is carried through the longest continuous pair of railway tunnels in the world - sixteen miles without a break. The Piccadilly Tube has pushed out northwards through Southgate right up on to the Northern Heights at Cockfosters; and west-wards from Hammersmith to a junction with the Metropolitan District line, so that through Piccadilly trains are now seen at Houn-slow, South Harrow and Uxbridge. Another important development has been that of the Bakerloo Tube, breaking, surface at Queen’s Park, and linking up with the main line of the London, Midland and Scottish Railway, so that tube trains - irreverently known by local residents as “Caterpillars” from their curiously squat appearance in comparison with the ordinary main-line trains - run right through to Watford alongside the “Coronation Scot” and other famous LMS expresses. Watford Junction, some twenty miles from Charing Cross, is the outermost limit of London tube train travel. In 1937 work was started on the extension of the Central Line eastwards from Liverpool Street to Ongar, in Essex, and westwards to Ruislip, on the Great Western and LNER joint line. The Highgate arm of the Hampstead Tube is planned to be extended from its terminus to join the LNER at East Finchley, and its trains will then run through to High Barnet. In extending the City and South London Tube from both its extremities to join the Hampstead Tube at Camden Town and Kenn-ington, some remarkable engineering work was involved. Making the junctions at Camden Town in particular was a difficult feat. At this point the existing tubes of the Hampstead line bifurcated, two going northwest to Golder’s Green, and two northeast to Highgate. As is customary at all tube junctions, the junction here was so arranged that the northbound Highgate trains should not have to cross the southbound Hampstead trains on the level, but, in the same way as a “flying junction” in the open, one tube was carried above the other, and conflicting train movements, which would considerably have reduced the traffic capacity of the line, were avoided. To bring the City Tube from the south into the same junction, however, was a vastly more complicated job. For the entire double junction, involving eight separate lines, had so to be planned that on reaching Camden Town, half the Charing Cross service and half the City service should proceed to Golder’s Green, the other two halves being taken to Highgate. Similar planning was required for working in the reverse direction. As trains in each of the eight tunnels would be succeeding one another at a max-imum frequency of one every ninety seconds, the task of splitting up the services and keeping them clear of one another required the most careful thought and planning. For example, a City train must be able to pass to Highgate simultaneously with a Charing Cross train running through the junction to Golder’s Green, and vice versa. At the same time similar movements would be taking place on the lines to the south. No “flat” junctions were possible in such conditions, and all trains running over directionally conflicting tracks had to pass over or under one another. The aim was realized by one of the most complicated mazes of tunnels to be found in any part of the world. UP PLATFORM of Wood Green Station, on the Piccadilly Line. The doors of the train are opened and closed pneumatically by the guard, and the train cannot be started until all the doors are closed. Electric indicators above the platform show the destination of each train as it comes into the station. The most remarkable feature of the junctions is that they were effected, deep clown in the darkness underground, without stopping for one single day the busy service of trains always passing through the existing tubes to and from Hampstead and Highgate. Manipulating a junction of this description, with trains passing at such rapid intervals, would be far beyond the capacity of ordinary manual signalling. All the equipment at Camden Town and other London Underground junctions is electric. One touch of a miniature lever sets the appropriate switches and the signals that govern them. The train service, at its maximum, is at the rate of 110 trains an hour, requiring 1,184 lever movements every sixty minutes; and a curious feature of the working at Camden Town is that the trains on only one track of the eight are visible to the signalmen, two of whom are always on duty. But the running over all the remaining lines is made clearly visible by an illuminated track diagram above the levers, on which, by appro-priate electric circuits, the position of every train within the area controlled by the box is clearly shown. For the stretches of line between the junctions signalmen are dispensed with, and by entirely automatic means the trains signal themselves. Normally the signals stand at “clear”, but as each train passes a “stop” signal, it changes the indication to “danger”. This is done by continuous track circuits, whereby weak electric currents flow through the running rails. When a train is running through or standing in a track-circuited section, it short-circuits the current through its own wheels and axles, thus breaking the circuit, and putting the signal immediately in rear of it at danger. The signal remains at danger until the train has passed into the next section ahead, when the normal flow of the track-circuit current is resumed, and the signal concerned returns to clear. In this way the trains maintain between one another a distance which is never less than the distance between two adjacent stop signals, though these may be so close together that two trains are in sight of each other. With trains travelling over the same line of metals at a frequency which, on certain sections, reaches a maximum of forty trains to the hour, and in one instance forty-three, it is a matter of vital importance that the signalling shall be supplemented by some device which will automatically stop a train should its driver inadvertently pass a signal at danger. At each stop signal, therefore, an arm is provided at track level which stands in a vertical position when the signal is at danger; and under the leading motor coach is a trip-handle which, if intercepted by this upstanding arm, will cut off the current to the train motors and apply the brakes on the train. As soon as the signal changes from danger to clear the arm drops out of action, and the trains pass without inter-ception. In this way a collision on the London Underground is virtually impossible. An extremely close and careful watch is kept on all Underground signal failures, because, with trains at such close intervals, if a train is held up for a few minutes only, the delay will react on other trains for a considerable distance back, and a stoppage of, say, half an hour, apart from special measures to deal with the trains, would cause chaos. So perfect is the working of the signals, however, that failures have now been reduced to an average of not more than four in every million signal movements. Various other emergency devices are in use to ensure perfect safety in running. The controller in each driver’s cabin incorporates a flat knob, which presses against a weak spring. This knob can be held down continuously without effort by pressure of the driver’s hand, but directly the pressure is relaxed sufficiently for the knob to rise, the current is cut off and the brakes are applied. In the event of the sudden incapacity or death of the driver, therefore, the knob would rise and his train would immediately be stopped. This device bears the appropriate but somewhat gruesome name of “dead man’s handle”. ROTARY EXCAVATOR used for driving the tunnels of the Great Northern, Piccadilly and Brompton Railway. The face is shown on the right. The arms rotate and the cutters excavate the earth. Hydraulic rams at the back of the excavator (left) drive the excavator forward. The tunnels driven by this excavator have the standard diameter of 11 ft 8¼-in. In the running of trains there may arise emergencies such as short circuits, causing smoke and fumes from burning insulation, or arcking of the current, which in the confined limits of the tunnels might be dangerous. Along the walls of each tunnel, therefore, run two bare telephone wires. To these, if the emergency is not serious, the driver of a train which has come to a stand can, by leaning out of the side window of his cab, hook a portable telephone set, and so communicate directly with the sub-station. If the trouble is serious, however, the driver pinches the two bare wires together and automatically operates the substation cut-out, thus cutting off the current from the live rail. At the end of station platforms where the trains enter the tunnels headway clocks may often be seen. These indicate to a driver the exact time interval between the next train ahead of him and his own, thus enabling him to regulate the use of his current in the most economical way if the distance between the two trains is but short. As each train passes the headway clock, the minute-hand is automatically reset to zero, similarly to the fly-back hand of a stop-watch, and then begins slowly to move round the dial again. Each of the clocks also contains a circular paper chart divided into hourly spaces, and each time the hand flies back to zero an ink mark is made on the chart, so that a permanent daily record is thus available of the headways between trains at this particular point. In the circular booking office at Piccadilly Circus, immediately below the street level, the passenger’s eye may be attracted by a series of six large dials, neatly arranged in a glass case on the wall in two rows of three, and bearing above the legend “See how they run”. Each dial is slowly in rotation, and every few seconds a “click” is heard; close scrutiny shows that at that moment on one of the dials a small pen, with a jerky movement, has made a mark, and that on each dial these marks, closely spaced, are appearing at regular intervals of one and a half to two minutes. Each “click” and each corresponding ink mark represent the passage of a train. The working of these dials needs a word of explanation. When the various underground lines were grouped together as the Underground Electric Railways of London, a central control office was established, and it became desirable that the chief controller should have his eye on the whole system at one time. A comparatively simple method was therefore devised for this purpose. 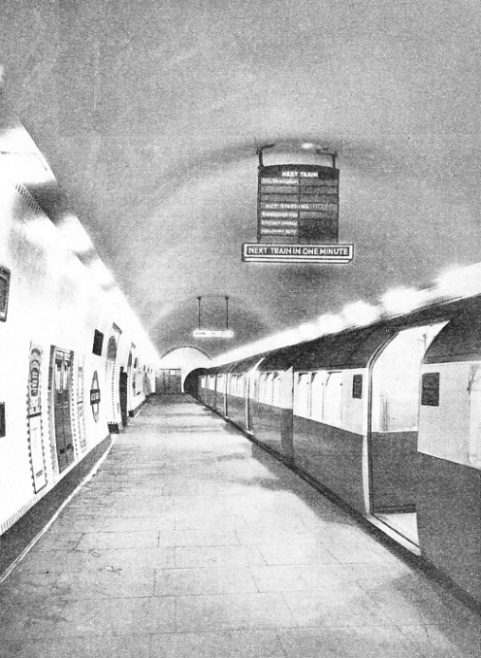 At a certain point in the track of each of six constituents of London’s Underground - the Piccadilly Tube, the Hampstead Tube, the Bakerloo Tube, the Central London Tube, the City and South London Tube and the District Railway - an electrical contact was fixed in such a way that every passing train would cause it to function. The impulse is thus conveyed immediately to the pen of the appropriate dial, and on the dial, the paper of which is renewed daily, and which rotates once every nineteen hours of the Underground working day, each train thus makes its mark. If the train service is working normally, these markings will be evenly spaced round the margin of the dial. But if, on any one of the six dials, a gap begins to open out, it is apparent that something has occurred to upset the train service on that particular tube. The controller can immediately put himself in touch by telephone with all those concerned, so that all necessary measures may be taken without delay. STREAMLINED TUBE TRAIN introduced on the Piccadilly Line, which extends from Cockfosters, through central London to Uxbridge and Hounslow. The extremities of this line are above ground. The motors of the streamlined train have a horse-power of 1,656 and the train has a potential acceleration of two miles an hour a second, with a top speed of sixty miles an hour. The Underground authorities are so justifiably proud of the smooth working of their wonderful network of lines that replicas of the controllers’ dials have been brought into the open at Piccadilly Circus and at St. James Park Stations, connected up with the same circuits. On these dials the interested passenger may, as invited, “see how they run” and marvel at the daily efficiency of London’s Underground. Seconds and even split seconds are of the utmost importance in all Underground operations. The first indication of speed in oper-ation is found in the booking hall. Here a number of passengers can book simultaneously at a battery of automatic ticket machines, the tickets being arranged in zones, so that one ticket covers a whole series of different destinations. Booking offices also are provided, but these are small glass-enclosed rooms in which tickets are instantly printed and change is given by automatic machinery. Down to the trains passengers at many stations are carried by continuously moving stairways or escalators, which are capable of handling large masses of passengers with far greater rapidity than the old-time lifts. Modern escalators are often made in tri-plicate, with one stairway reversible, so that according to the flow of traffic an additional escalator may be brought into use in either direction. On the arrival of the tube trains the passengers have no need to open the doors, for these are pneumatically controlled by one or two gatemen along the length of the train. Until all the doors are properly closed, it is not possible to ring the bells along the train to the motorman, and until he has this signal he is unable to start the train. Pneumatically-operated doors, first introduced on the Piccadilly Tube, have reduced station stops to an average of twenty-two seconds which is half their duration in earlier days. The modern tube coaches are about 50 feet in length, and are specially designed with wide spaces round their three sets of double doors and a limited amount of seating in the remainder of the vehicle. The idea is that at the extremities of each journey, and during the slack hours in Central London, there shall be ample seating accommodation for all passengers; but that at rush hours a certain proportion of the passengers shall stand in the vicinity of the doors, as this arrangement greatly expedites the work of egress and ingress at the stations. Were sufficient seating provided for all passengers at the maximum rush periods, the trains would be so long that the speed of Underground transport would be considerably slowed down. In the tunnels themselves a short and sharp downgrade from each station adds the acceleration due to gravity to that obtained by electrical means, and so speeds up the station-to-station times. A rising gradient into each station also makes it possible to reduce brake-power and so minimize the wear and tear of the braking equipment. For many years past gradual acceleration has been going on in London’s Underground train services; overall average tube speeds, including all the many stops, have now mounted to a general average of eighteen miles an hour, inclusive of the many intermediate stops. Maximum speeds between stations rise to between thirty-five and forty miles an hour. In the most recent streamlined Underground trains the motor horse-power is increased from 960 to 1,656 and the potential acceleration—two miles an hour a second - is the highest yet attained below London. These new trains are capable of a maximum speed of a mile a minute, and may well revolutionize London’s already amazing Underground travel facilities. ONE OF THE PLATFORM TUNNELS at Camden Town, on the Northern Line. The tube emerges into a larger tunnel, into which subways lead from the escalators connecting with the surface and with other platforms. You can read more on A London Tube Extension on this website.